When Amory Lovins, the Colorado based energy efficiency guru and chief executive of the Rocky Mountain Institute, learned that Ontario plans to plough $40 billion into nuclear power, he blew a gasket. Still, the Ontario government is moving full bore ahead with plans to build two new nuclear reactors and refurbish up to half a dozen others. What gives? Simple economics. Ontario is a power-hungry province and if nothing is done, demand will soon exceed supply. By 2025, the Ontario Power Authority estimates the province will need between 30,400 and 36,000 MW of power generation to meet peak demand times for a population projected to grow by 25 per cent, up from peak needs of 24,200 MW today. Ontario has a little over 34,000 MW at hand today, which seems enough to satisfy even the upper end of the OPA’s estimated demand in 2025. But the problem is, previous NDP and Conservative governments did almost nothing to address Ontario’s future electricity supply. As a result, most of Ontario’s current power base will be decommissioned by 2025 and only about 12,000 MW of today’s current generating capacity will be around by then (hydro, oil and gas, and one unit of Pickering A nuclear station). Interestingly, the renewables part of the provincial power portfolio seems to have the longest lasting power. ‘Dictates the types of resources’ is a euphemism for ‘pump up the nuclear.’ Notwithstanding some initial political enthusiasm for energy conservation and new hydro and wind resources, Queen’s Park’s confidence in these resources as base-load supply has wilted. No wonder, when you consider the heat wave in July that drove Ontario’s energy consumption (read ‘air conditioning affinity’) to a record 27,000 MW. Meanwhile, droughts reduced water flow to hydro facilities and—the straw that broke the camel’s back—any MPPs driving past Toronto’s landmark Wind Turbine at Exhibition Place could see the turbine blades hanging motionless, contributing absolutely no power to the grid. At the same time, the province was trying to woo businesses to relocate to Ontario and having a tough time answering questions like: “Where is my factory going to get MWs when you close the coal plants?” Energy-efficient light bulbs and wind turbines don’t cut it for these guys. The government’s answer: Natural gasfired plants, and a promise not to get rid of coal until enough nuclear base-load capacity has been brought online. That answer seems to have worked for companies like Linamar Corporation and Toyota Canada, which recently announced investments in Ontario totalling $1.9 billion, which will create 4,300 high-quality jobs. When you adopt this mindset, a rational person might understand why the government decided to pump $40 billion down the old nuclear path. But when you consider that this nuclear path is littered with 300 per cent multi-billion dollar cost-overruns, delays, and breakdowns, the choice might seem odd. That is, until you look at whom the government is depending on for advice. 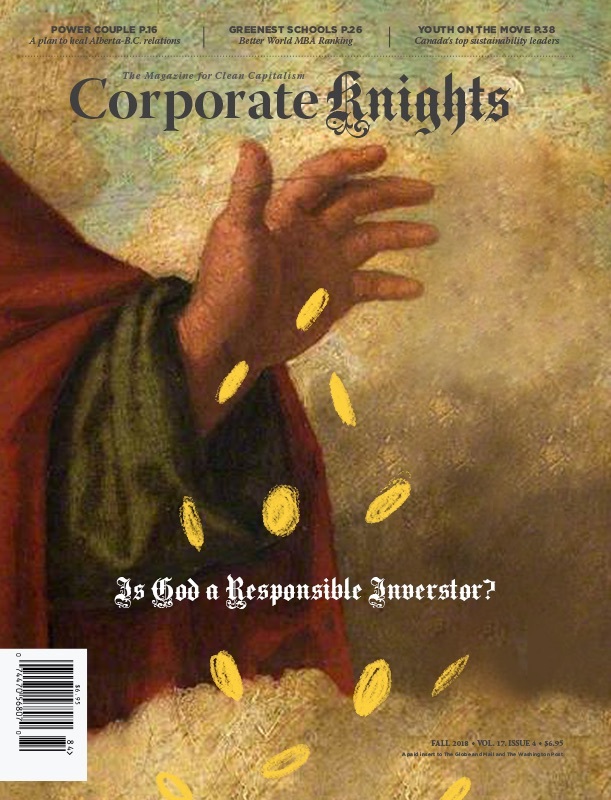 Environmental groups have pointed out that a number of former top people in the Premier’s office are now paid lobbyists for nuclear industry players, who have much to gain from the government’s nuclear strategy: Murray Elston, a former Ontario Liberal Minister and supporter of Dalton McGuinty’s leadership bid lobbied the province for the Canadian Nuclear Association; David MacNaughton, Premier McGuinty’s former principal secretary, is a lobbyist for Atomic Energy of Canada Limited; and Bob Lopinski, the Premier’s former director of legislative affairs, lobbied for Bruce Power, the operator of the Bruce nuclear station. But that is too simplistic an explanation. Rather, the present nuclear preoccupation is a result of advice from the OPA and other electricity sages the government relies on to formulate its long-term strategy for energy. Most of these people have engineering and science backgrounds. I never met an engineer who saw an engineering problem he/she couldn’t solve and the bigger the better. But most engineers are more comfortable working through a complicated calculation than negotiating sensitive revenue-sharing/right-of-ways with a dozen First Nations groups while also fending off environmentalists’ blockades. As a rule, engineers like big solutions to big problems. The less unpredictable human behaviour to factor in, the better. Almost every engineer I spoke to at Ontario Power Generation, Hydro One and the Ministry of Energy supported a variation of a common theme: Build a nuclear plant here, upgrade one there, and it’s all close to where the power gets consumed. Less power gets lost in transmission, and little need to negotiate new multiple right-of-ways. Learn from past mistakes on Darlington and others. Do better. But I’m an economist with a masochistic attraction to complex social conditions. So when I look at a map of Ontario, I don’t see the little pencil dot. I see 630,000 MW of wind power (for scale: that’s more than 20 times Ontario’s current peak consumption) and upwards of 7,500 MW of new hydro, but almost all of it stranded in the northern part of the province, inhabited by First Nations communities living in poverty conditions with few wealth-building prospects. This vast power potential is stranded because there is no transmission grid to get it down to market. I see a means to tap that power in a way that will enrich Ontario’s north and save Canada in the process. It was the grand plans to build a coast-to-coast railway that made Canadian Confederation possible. The Maritimes only joined because of promises to build the Intercolonial Railway, and British Columbia only because of a promise to build a transcontinental railway. Today, most of our trade and transportation routes run north-south to the US, rather than east-west to other provinces. Many Albertans have more in common with Montanans than Montrealers. If you asked energy-rich Albertans, Newfoundlanders and Quebecois, “If you were your own independent nation today, and were invited to join Canadian confederation, would you?” the answer would be highly disturbing for most Canadians. Infrastructure follows economies, but economies also follow infrastructure. Ultimately, economies influence political borders. As nine out of ten Canadians live within 160 km of the US border, the only room for the country to grow is northward. Thanks to a warming climate, abundant natural resource wealth, and a soon-to-open northwest sea passage, now is a good time to start laying down infrastructure roots that Canada’s northern expansion can use as a foundation for growth. What miracle project can tackle both Ontario’s energy crisis and northern poverty, all while reinvigorating the federation? The Green Power Corridor, an east-west power grid stretching from northern Manitoba’s rich hydro power reservoirs across Ontario’s far north, nudging up againstthe frigid windswept coast of Hudson and James bays, across to Hydro Quebec’s energy super complex, and onwards to the roaring whitewater of the Lower Churchill in Newfoundland and Labrador. The grandest nation-building project since the transcontinental railway. The idea of an east-west grid has been around for some time. But so was Free Trade. It took a hundred years to finalize that one. Unlike free trade, no one has had the political will to make the grid happen—yet. In his book White Gold Karl Froschauer argues that if the provinces had chosen to integrate their power projects within a national electricity network, substantial technical, economic, and environmental advantages could have resulted. Recent events conspire to put an east-west grid at the centre of the country’s electricity generation strategy. The Ontario and Manitoba governments are attempting to resurrect a deal that Premier David Peterson cut two decades ago—which cash-strapped Premier Bob Rae subsequently cancelled in 1992 for a $150 million penalty—so that Ontario can tap northern Manitoba’s plentiful hydro power, starting with Nelson River’s proposed 1,380 MW Conawapa Generation Project. Quebec recently set in motion investments that will bring an extra 8,500 MW of wind and hydro power online by 2015, and they’re eyeing Ontario’s power-hungry market for exports, with plans to lay a new $400 million, 1,250 MW interconnection to Ontario’s side of the south Ottawa river by 2009. The plans are in motion and everybody agrees that some serious clean power is going to flow. The crucial questions are where and how? Until this is determined, the bulk of the north’s clean power potential faces a double risk and is stuck in limbo. Michael Fox, a resource sectoral specialist with the Nishnawbe Aski Development Fund, explained: If you are going to spend money [on a hydro or wind project], it hinges on a transmission line. And that hinges on an agreement between two provinces. That’s double risk. 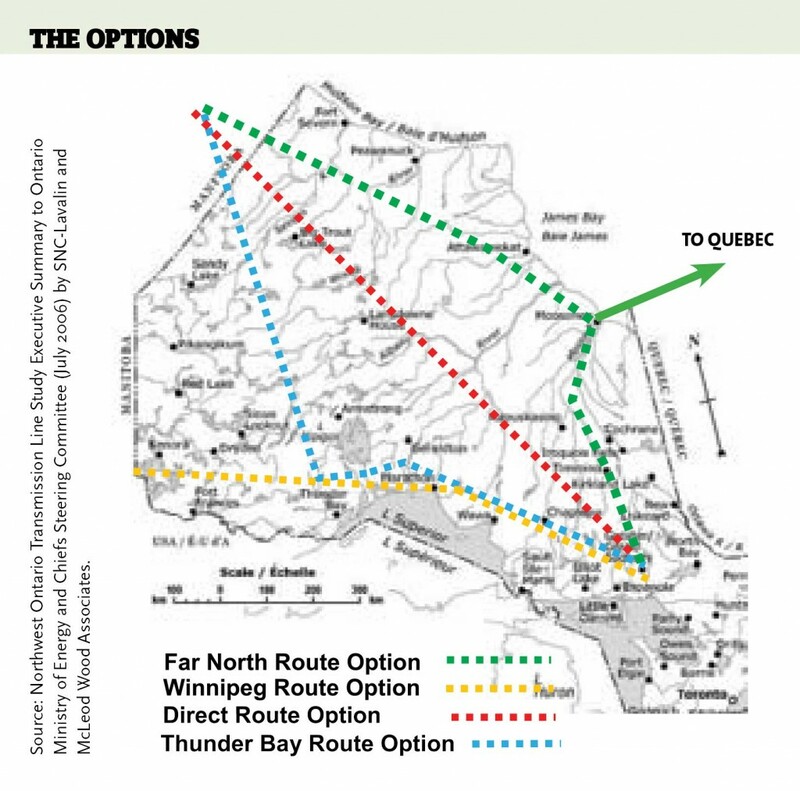 The 258-page Northwest Ontario Transmission Line study prepared by SNC-Lavalin and McLeod Wood Associates Inc. for the Ontario Ministry of Energy and Chiefs Steering Committee sets out four route options to kick off the first leg of the Green Power Corridor that would bring Manitoba’s northern hydro to Ontario (see map on previous page). Of the four routes under consideration, only one maximizes the ability to tap the north’s vast power potential. The 1,610 km route, fittingly called the Far North Route Option, would bring power from northern Manitoba via James Bay to Sudbury for a price tag of about $2.4 billion, with $1.5 billion of the tab falling to Ontario. Getting this power to Toronto would require upgrades to Ontario’s north-south transmission capacity. The second installment of the Green Power Corridor would be to connect to Quebec’s northern grid complex from Moosonee on the Ontario side of James Bay. Before this, Manitoba, Ontario and the northern First Nations communities have to agree on a route. Up to now, a sticking point has been what price Ontario will pay for Manitoba’s hydro. Because Manitoba knew Ontario was in a pinch for power, it had the upper hand in price negotiations. 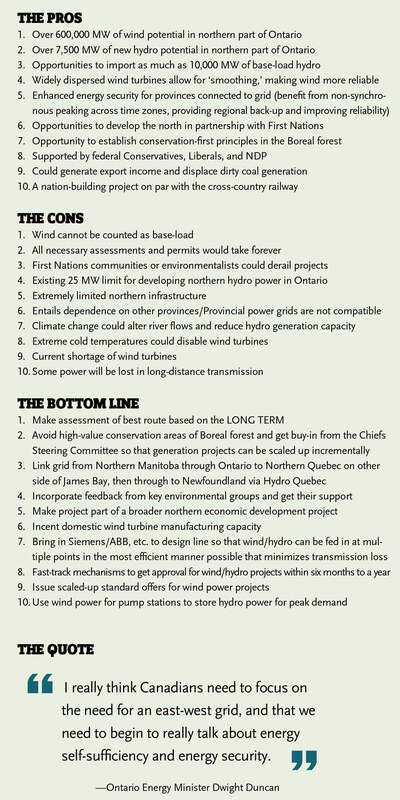 Before the SNC-Lavalin and McLeod Wood Associates first-of-its-kind study catalogued the north’s power potential, Ontario presumably needed Manitoba’s power more than Manitoba needed Ontario’s market. It was not an equal relationship. But now the two provinces are on a more equal footing. Both have something to offer, but neither is desperate. “The insight we have through this [Northwest Ontario Transmission Line Study] exercise is that a lot of these potential projects [in Ontario] are standalone projects—you don’t need the corridor from Manitoba,” Mr. Fox said. This news should help pave the way for a healthy partnership between Manitoba and Ontario, along with the First Nations communities. The two biggest potential adversaries of a northern Green Power Corridor—northern First Nations communities and environmentalists concerned about a thousand-mile path that cuts through Canada’s Boreal forest— are in fact big boosters. An executive at Hydro One told me they were surprised how enthusiastic the First Nations communities were about the prospects of a power line. The First Nations are actually quite eager to seize the economic opportunities that opening up the north would entail. But rather than stoking support, the Ontario Ministry of Energy is trying to temper expectations. The key going forward will be to intimately involve First Nations communities in the planning and economic upsides of the project, and encouragingly, the ministry is taking this path. While there would be a substantial environmental footprint made by an east-west power line—and the accompanying hydro and other developments—environmentalists see the Green Power Corridor as an opportunity. Kyoto and Beyond, a report by the Climate Action Network, included the eastwest grid between Manitoba and Ontario as part of the plan to shut down nuclear reactors and coal-fired power plants. The key to sustaining the environmental community’s enthusiasm will be to ensure that any potential route takes careful consideration of highvalue conservation areas of the Boreal forest. Provided this ‘conservation-first’ principle is followed, the Green Power Corridor would be the largest development ever supported by environmental groups from the Sierra Club to the David Suzuki Foundation. A wellspring of business ingenuity and investment is ready to pour forth to the north, once this political partnership is set in motion. TransCanada Pipelines has already held talks with provincial governments about the role it could play in laying down an east-west grid. SNC-Lavalin has world-class expertise, having planned, designed, and constructed over 90,000 km of transmission and distribution lines and some 1,500 substations. ABB—which is building a 3,000 MW, 1,100 km line in China, connecting the Three Gorges Dam to Shanghai for US$390 million—has recently rolled out a suite of new Flexible AC Transmission Systems devices, innovations in transformer technology and powerline carriers, which enable power lines to transport data as well as electricity. ABB could also supply its tailor-made solutions for interconnecting windmills and connecting wind farms to the national grid system. Siemens has a strong track record for integrating both AC and DC transmission technologies, and for embedding decentralized or dispersed generators such as wind farms (off- and on-shore) in power systems requiring customized solutions for grid access. General Electric Co., which manufactures turbines for one of Quebec’s major wind power projects in the Gasp. region, would be a natural partner to build turbines in Ontario’s north. Emerging clean energy powerhouse Ventus Energy is already developing a 5,000 MW portfolio of wind projects, many of them as special partnerships with First Nations communities, including the Cree Nation of Chisasibi in northern Quebec, the Pays Plat First Nation on the north shore of Lake Superior, and the Métis Nation in Labrador. Mark Wiseman, who heads up private equity for the Canada Pension Plan Investment Board, told me they’re looking for large-scale infrastructure projects in which 0to invest. He recently closed a US$350-million investment in Chilean electricity transmission company Transelec Chile.